“[The Rookery]… crazy wooden galleries common to the backs of half a dozen houses, with holes from which to look upon the slime beneath; windows, broken and patched, with poles thrust out, on which to dry the linen that is never there; rooms so small, so filthy, so confined, that the air would seem to be too tainted even for the dirt and squalor which they shelter; wooden chambers thrusting themselves out above the mud and threatening to fall into it – as some have done; dirt-besmeared walls and decaying foundations, every repulsive lineament of poverty, every loathsome indication of filth, rot, and garbage…” Charles Dickens, Oliver Twist. A house move on the horizon means some changes to the current plans for Basilica Fields. Don’t worry, this journal isn’t going to disappear into the ether or grind to a halt, nor am I instead going to take up a new hobby knitting my own slippers, but the intention to build Artillery Lane as the first segment of Basilica Fields is now under intense scrutiny. None of the potential new houses we’ve looked at so far have an outbuilding large enough to house the scenic segment of AL and I don’t really want to go down the road of constructing such a building just yet. All have a larger workshop space than I already enjoy, and would see me up and running in the day job again very quickly. The change means that this journal will at last slip into the format which I had initially conceived; that being research on one segment (in this case Artillery Lane) will continue apace, while building of another segment (The Rookery) gets under way. In fact, initially I’ll be building just a portion of The Rookery, and not the whole shebang, but that’s all to come. So, the next few posts will be dedicated to unpacking The Rookery before you, the research for which is mostly well in hand. 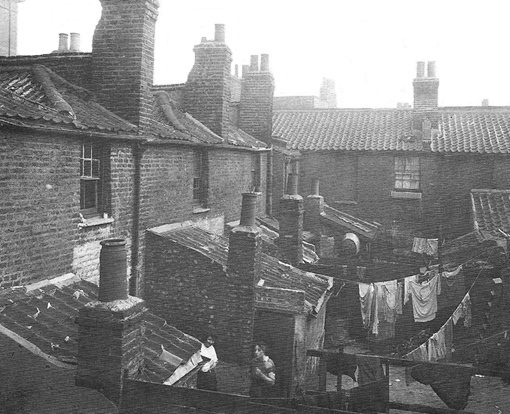 The backs of houses at Collingwood Street, part of the Old Nichol Rookery, Bethnal Green. It’s obviously Monday morning with the washing on the lines, and a bathtub hangs from the eaves of the outbuilding in the distance. Lots of lovely chimneys and pantiles! After the Great War all of this slum and more was swept away and the first post-World War One London County Council housing built on the site. However, it’s the photos of the children that steal this piece, and their eyes speak volumes. Further edit: OK, they’ve changed a couple of photos since I posted the above and have employed a reject comedian to rewrite the captions. So much potential for an article, such a waste. 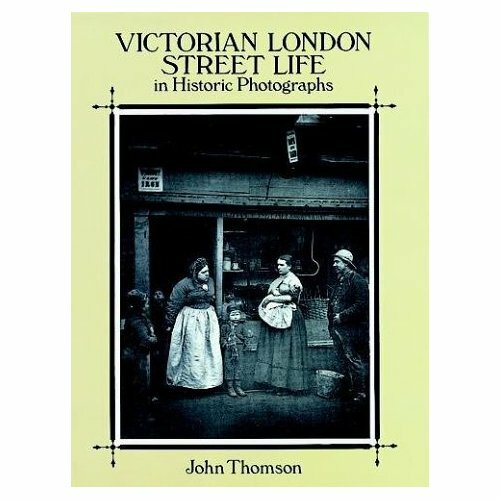 If you’re really interested in the social conditions of Victorian London, then the contemporary Victorian Street Life in Historic Photographs by John Thompson, first published in 1877 and reprinted by Dover Publications in 1994 is a fantastic, and often quite shocking work. Highly recommended. New edition edition published 1994 by Dover Publications Inc. 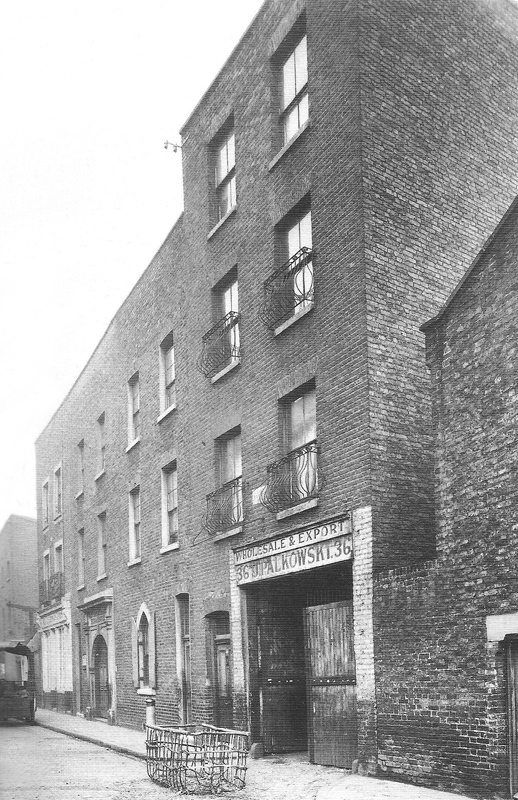 Following the dispersal of the Huguenots and Irish after the collapse of the silk weaving industry, in the middle of the nineteenth century a significant number of Dutch Jews or Chuts settled in the Tenterground area of Spitalfields, bringing with them the trades they practised in Amsterdam such as cigar, slipper and cap making. These tradesman and their families emigrated due to the prejudice which barred them from the guilds in the Netherlands and the slide of the Dutch economy. Following the assassination of Alexander II of Russia in 1881, 120,000 Ashkenazic Jewish émigrés, mostly impoverished rural workers, fled persecution in Europe and also settled in England. 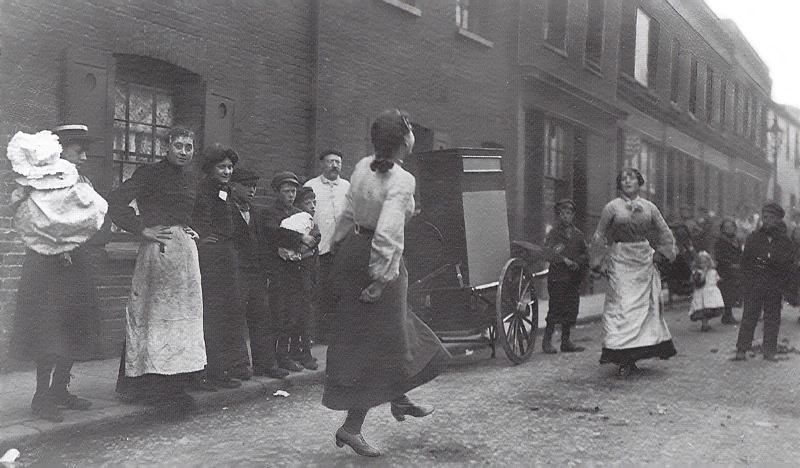 A significant proportion of these refugees gravitated to the East End, often sub-dividing the old Huguenot houses to accommodate as many families as possible, until in some areas Jews accounted for up to 95% of the population. Their vast numbers initially caused much local tension, not only between themselves and the Chuts (whose practices such as eating non-kosher seafood were considered unclean), but with other local communities too. 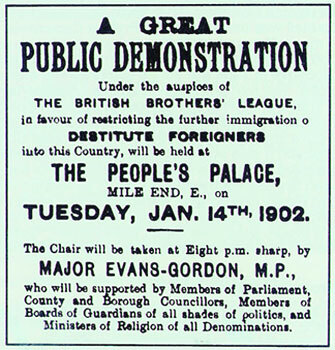 A popular and media backlash ensued, gaining the support of notables and the trade unions which resulted in the formation of the anti-semetic restrictionist group The British Brothers League, the demands of which prompted the government to introduce The Aliens Act of 1905. The Act sought to control immigration by preventing paupers and criminals from entering the country, but also ensured asylum for the religious and politically persecuted. Before long, mechanised cigarette making machines caused the cigar economy to collapse and the Chuts began to disperse, some returning to Amsterdam, others emigrating to the USA, and some assimilated themselves into the wider Jewish community in the East End. The language of the Ashkenazim – Yiddish – a High Germanic dialect formed from a fusion of Hebrew, Aramaic, Slavic and Romanic languages, and written in the Assyrian script, soon predominated the area and could be seen in shops, signs, billboards, newspapers and theatres. 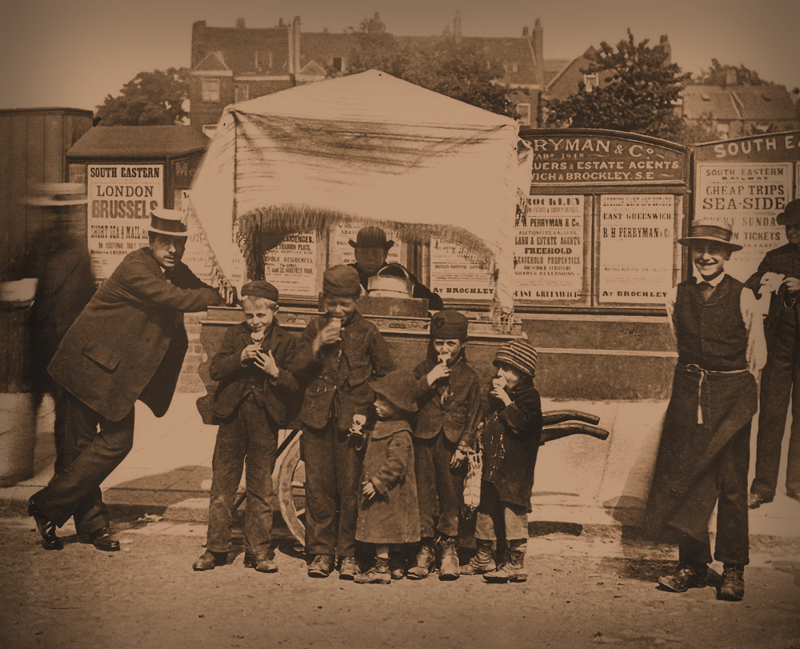 Food and its preparation was obviously important, and soon shops and markets began to thrive, such as kosher butchers, bakers, fish sellers, general grocers and sundry stores. Of course religion played an important part in Jewish life, and just as everyone in England lived within the sound of a church bell, synagogues sprang up to tend the spiritual needs and to provide welfare to the living, and chevra kadisha to deal with the practicalities and rituals of the dead. Old Castle Street synagogue in Whitechapel was a typical example of old housing converted to a place of worship within the Jewish ghetto. The entrance (to the right of the wagon) was an obvious feature, situated as it was within a residential and commercial terrace. Joseph Polowski, a china and glass wholesaler, had his export warehouse to the right, as well as a corner shop beyond the wagon in Wentworth Street (one of the border streets of the Tenterground enclave), in which, incidentally, there were no fewer than fifteen kosher butchers by 1901.